It is seen that inspite of best efforts by various State Electricity Boards / Supply / undertakings in India, the voltage at consumer's end is never constant. In most of the Indian States, during the day time when the load requirements is more the voltage remains quite low and during night it goes up than the normal. As a result of these never ending voltage fluctuations there is frequent Tripping / Breakdown of the systems / machines and precious equipment's resulting into low production. Our high qualityStabilizers/Servo Voltage Stabilizercan overcome and control these voltage fluctuations & can provide you with the desired constant output voltages. Our every Servo Voltage Stabilizer rolled out of the factory undergoes strict and rigid inspection and testing. 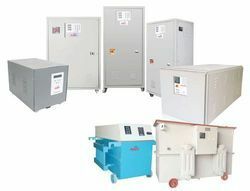 We Rental Solutions also offers solutions for solving all power problems faced by industries and domestic computer users.Arzoo Energyoffers rental services forvariable auto transformer,digital inverter,servo voltage stabilizer. Arzoo Energy quality policy is to attain client's satisfaction by providing indigenous, innovative and quality products at affordable prices and providing after sales services at minimum downtime. It is a name that is synonymous to quality, reliability and customer satisfaction. As our Motto "Complete Power Solutions" clearly indicates that our expertise lies in providing most affordable & qualitative solutions to our customers. 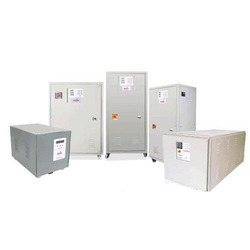 Arzoo Energy Servo Voltage Stabilizers are available in a vast choice of Input and Output Voltage range suitable for various applications in industries, institutions and residences etc. having indigenous, imported sophisticated machines / instrument / gadgets etc. It gives us enormous pleasure to provide an impeccable assortment of Single Phase Stabilizers. We fabricate and develop this product assortment making use of supreme grade raw material and other quality components to make sure their hassle free performance and safe usage. Along with this, we focus our all product to strict examinations so that a flaw free assortment reaches at customers’ destination. We are learned team of engineers and technicians engaged in offering Stabilizers that finds it application in varied industries like steel, cement, mining etc. This is specifically used to supply continuous output and input voltage in situations of fluctuating power supply. This is a highly reliable and performance oriented stabilizers that are created with use of industry standard components. This can be availed at a leading market rates after a thorough check by our qualified technicians to certify compliance. • Under / Over Voltage protection. Our hard work in customer satisfaction has always positively paid us and thus we continue to do so with offering a range of Air Cooled Stabilizers that are highly efficient and cost effective. With a primary application in ensuring continuous supply of power in electrical or electronic equipment this is created with at most precision and care. Our team of learned engineers constantly are involved in research and development in the offered field to ensure the best is catered to our customers. 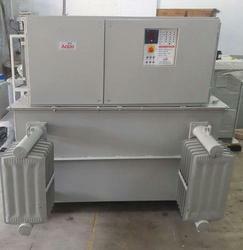 • Available from - 1 KVA to 1500 Kva. • Correction Rate better than 40 V/sec. • Cooling : Natural Air. • Ambient Temperature 40 to 55 C.
• Selection Auto / Manual. • Overload & short - circuit protection. • More than 98% efficiency. • Built in EMI / RFI Filter. Our hard work in customer satisfaction has always positively paid us and thus we continue to do so with offering a range of Oil Cooled Stabilizers that are highly efficient and cost effective. With a primary application in ensuring continuous supply of power in electrical or electronic equipment this is created with at most precision and care. Our team of learned engineers constantly are involved in research and development in the offered field to ensure the best is catered to our customers.